With Cloud Computing and the Internet of Things (IoT) we are facing two trends of which each one for itself has the potential to change the whole IT industry. Recently, these two trends are being combined in IoT device clouds enabling businesses to efficiently collect data from the Internet of Things and manage devices that connect things to the Internet. The advantage of such device clouds over classical Machine-to-Machine (M2M) telemetry solutions is that they connect potentially any kind of device to a consistent, well-managed, centralized storage in the cloud from where any application can uniformly access the data collected from the devices and things respectively. In contrast, classical M2M solutions tended to build vertical silos as they typically connected a specific type of device to a certain application often using proprietary technology. 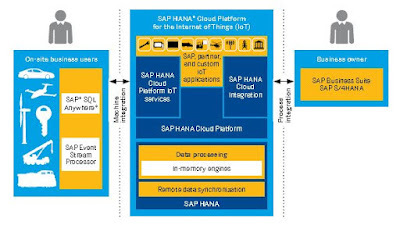 With today’s announcement of the SAP HANA Cloud Platform for the Internet of Things, SAP now also offers a set of services on top of its cloud platform that extend its capabilities towards a full-fledged device cloud. In a typical IoT technology stack the newly announced capabilities can be found on the device management and application enablement layers (see figure below). So, SAP now perfectly complements its strong IoT capabilities in the areas of big data, analytics, messaging, and business process integration with this new offering. Thereby, SAP’s IoT technology stack becomes one of the most comprehensive stacks that you can get within the industry from one single vendor. Rather than stopping with sensor-to-cloud or sensor-to-insight, SAP covers the whole stack from sensor to action through its deep integration capabilities with business processes and business networks. On the network connectivity layer and the hardware layer that are not covered by SAP technology, SAP can rely on one of the strongest partner eco-systems in the industry. In addition to the deep vertical coverage of the IoT stack, SAP also has a broad technology portfolio on each layer of the stack. So, SAP customers are not forced into a one-fits-all solution but SAP supports them always with the right technology that best fits the customer’s needs. With various storage technologies, for example, SAP can support scenarios where one single machine produces 10s-100s of Mbytes of data per day and still can analyze this data in (near) real-time with the SAP HANA in-memory technology. At the other end of the spectrum, SAP cost-efficiently supports scenarios with classical relational database systems where a machine, e.g. a vending machine, only sends one text message per day with the current status information on the inventory. The same is true with the various messaging technologies that SAP offers. Overall, the SAP HANA Cloud Platform for the Internet of Things consists of the industry-leading SAP HANA Platform offering the superfast in-memory database and various database services, the SAP HANA Cloud Platform supporting various programming models, runtime containers, and applications services in a highly flexible, agile, and scalable cloud environment, and the SAP HANA Cloud Integration tools and services for messaging and process & data integration with on premise systems and other cloud infrastructures. The SAP HANA Cloud Platform IoT Services, announced today, are implemented as application services on top of the SAP HANA Cloud Platform. The figure below depicts the architectural blueprint of how all these components finally fit together. Current use cases include predictive maintenance and service for industrial assets, vehicle analytics, and connected logistics. If you are interested in such scenarios and want to learn more, you can get directly started with our starter kit. You can register for a free trial account, download the client code, and send IoT data to the SAP HANA Cloud Platform for the Internet of Things. You can find detailed information about how to do this at: https://github.com/SAP/iot-starterkit.